Take a trip to paradise with your pup in this stylish and fun Blue Lagoon Hawaiian Hibiscus Dog Dress with Matching Leash! 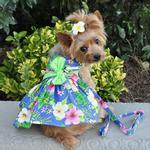 Get ready for a luau with the Blue Lagoon Hawaiian Hibiscus Dog Dress by Doggie Design! 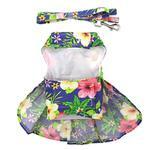 This fresh and bright dog harness dress is perfect for a walk on the beach, a pool party, or a tropical vacation. 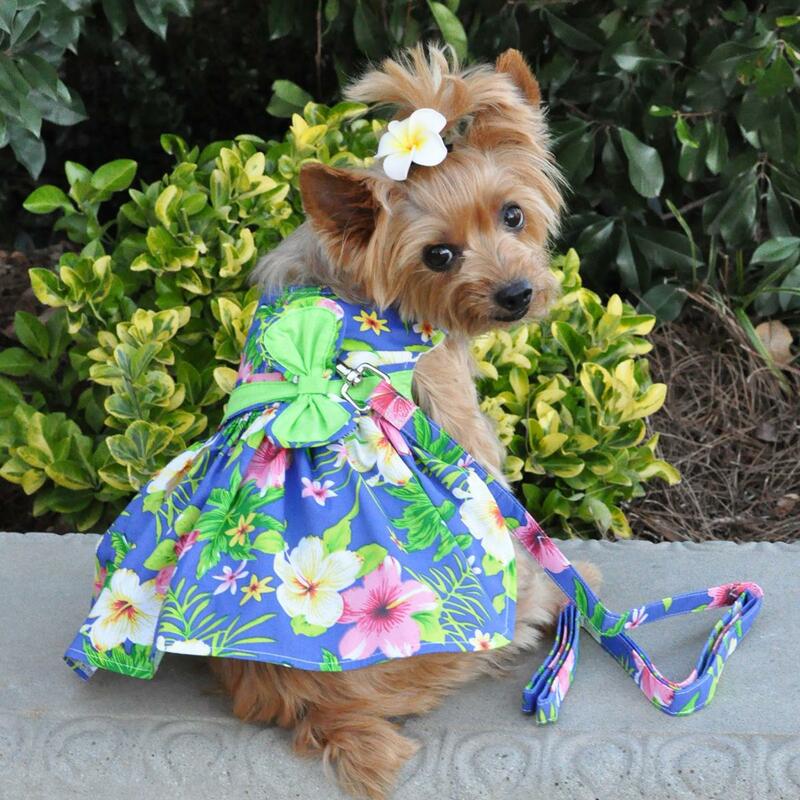 Anytime your pup wants to embody the spirit of Aloha, she'll be ready when wearing this dress! The 100% cotton fabric will keep your pup feeling breezy and cool as she lays on the lanai or sways to the marimbas. 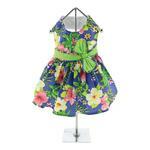 This Hawaiian dress for dogs features hibiscus flowers and other tropical foliage on a blue lagoon background. Blue Lagoon Hawaiian Hibiscus Dog Dress with Matching Leash by Doggie Design Customer Photos - Send us your photo! Love this dress! It’s beautiful, fits great, stays securely on, washes up easily. Miss Molly is a 2 year old, Ruby colored, Cavalier King Charles Spaniel who loves to wear dresses & pajamas! In honor of Easter and Reecee's 12th birthday on April 4, this was her gift from her human mom. Reecee also works as a service animal for her human mom. Paisley loving her new Blue Lagoon Hibiscus dress. Evidently It's very comfortable on, as she wore it all day even standing in front of the long mirror admiring herself. We love the dresses as they fit so well. She's 7lbs so I bought a small and it fits oerfect. Tink loves her new dress. She will debut it this week on Tink Tuesday. Lola wearing her beautiful Blue Lagoon Hawaiian Hibiscus dress to our very first trip of 2018 to the park! She jumped in my car and was ready to go! She loved all the attention she got...my shorkie loves to dress up and your clothes fit her perfectly! Best dressed girl at the laua! Chloe is almost 2. She has a fun personality. She loves her big brother, a larger Goldendoodle. Jordie loves her garden harness dress! Sassi Sue will look fancy in her new summer dress! Sammi & Sofie love dressing up! She is just the Joy in my Life.....she is my Service Dog and My besest friend ever! Little Rainbow enjoys wearing her new dress from Baxterboo! She looks so proud and confident in it! Sabrina & Baby Doll ready to go hunt Easter eggs in their new Lagoon Hawaiian Hibiscus dresses. The dresses have matching leashes too! There were a big hit at the hunt. Pretty summer Hawaiiin dress - good for any occasion. Well made, easy to put on. Posted On 10/25/18 by Kasey S from Syracuse, NY Yes, Kasey S recommends this product! This dress is so adorable! Looked great on my chihuahua and she was so pretty on easter! Posted On 09/02/18 by Tucson from Tucson, AZ Yes, Tucson recommends this product! 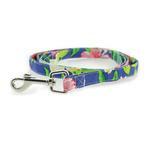 Molly loves her Hawaiian dress, it is so summery and it is also a harness with a pretty matching leash. How chic! I have purchased these beautiful dresses. I love them. They look so cute on my girl. Please note the blue is much darker than it appears in photo. Posted On 04/15/18 by cynthia h from Terre Haute, IN Yes, cynthia h recommends this product! This is an adorable dress & leash set. I ordered size Large for my 22 lb Cavalier King Charles Spaniel and it fits her perfectly. Posted On 03/02/18 by Iris S from Griffin, GA Yes, Iris S recommends this product! I love this dress on my Shitzu. A little big around the neck, but body wise fits great. I have dealt with this company before, and they have great well made dresses. Posted On 01/09/18 by Deborah Q from Biloxi, MS Yes, Deborah Q recommends this product! Sassy little girl is all in her Diva zone in this. Was so cute for spring look. Posted On 07/09/17 by Kristin M from Pleasant Lake, MI Yes, Kristin M recommends this product! Love this little dress! So cute and fits perfectly! And has matching lead. Nice quality product. Posted On 05/11/17 by Brenda V from Thomasville, GA Yes, Brenda V recommends this product! Beautiful. Love the colors of the Blue Lagoon dress. Posted On 04/30/17 by pam conser from the villages, FL Yes, pam conser recommends this product! Bought this Hawaiian dress, because my Yorkie will look adorable in it. Posted On 04/24/17 by tonya s from oriental, NC Yes, tonya s recommends this product! Sammi & Sofie love their new Easter dress! Posted On 04/23/17 by ldjackson1953 from Nampa, ID Yes, ldjackson1953 recommends this product! Beautiful colors, material and fit. Finally a dog clothes manufacture knows how to size clothes. Posted On 04/22/17 by judi h from near KCMO, MO Yes, judi h recommends this product! I bought this tiny dress for a new Dachshund puppy for Easter because it is a dead-ringer for my little Great granddaughters' Easter dress! How totally cute! They are adorable together! Posted On 04/19/17 by Betty B from New Holstein, WI Yes, Betty B recommends this product! My min pin looks really cute in her dress. Love it. Posted On 04/18/17 by Connie T from Martinsville, IN Yes, Connie T recommends this product! I got a medium for my 8lb yorkie. It fits perfect and looks so cute on her! I love it! Posted On 04/13/17 by Jesus M R from San Angelo, TX Yes, Jesus M R recommends this product! Posted On 04/13/17 by Julia H from , Yes, Julia H recommends this product! What a lovely dress at a great price! I especially appreciate the matching leash included. And the size guide is accurate. Posted On 04/11/17 by BJ Lynch from San Diego, CA Yes, BJ Lynch recommends this product! I have 2 American Hairless Terriers so I bought one of these dresses for each girl. They wore them to a church event on Sunday and they were the life of the party! They not only looked amazingly adorable, they loved posing for pictures. Posted On 04/07/17 by Natalie V from Aurora, CO Yes, Natalie V recommends this product! My French bulldog loved this dress. She wore it for her Easter Pictures and everyone loved it she received so many compliments. Thank You Baxterboo. This dress is absolutely beautiful on my Sassi Sue. The quality is fabulous, style is creative. We love it! Posted On 04/03/17 by leonora C from selma, TX Yes, leonora C recommends this product! Love the color and style of this dress, adorable! Posted On 04/02/17 by Barbara T from Santa Rosa, CA Yes, Barbara T recommends this product! Posted On 03/28/17 by Lilli W from Mt. Pleasant, NC Yes, Lilli W recommends this product! Very pretty dress. She has not worn it yet. Posted On 03/25/17 by Lawrence B from , MA Yes, Lawrence B recommends this product! Liked this item for my two dogs. Like the way the dress and harness that is built in all fit together and work well. Posted On 03/22/17 by Paula D from Concord, CA Yes, Paula D recommends this product! Absolutely beautiful Hawaiian print dress for my little Maddy. The floral pattern is very pretty and the design is spectacular. On top of that -- the workmanship is really great. The medium size is a perfect fit. Such a special Easter dress. Posted On 03/20/17 by Sylvia E B from Zephyrhills , FL Yes, Sylvia E B recommends this product! WOW! WOW! WOW! How adorable!!!! Looks so mature and fashionable. Will order in other colors. It's a must have!!!!!! Posted On 03/05/17 by Brenda V from Thomasville, GA Yes, Brenda V recommends this product! Blue Lagoon Dog Dress is one of my favorites! Posted On 03/04/17 by Susan G from West Lawn, PA Yes, Susan G recommends this product! My bichipoo looks darling in this summery dress that is perfect for walking as well as dressy. It is very lightweight, but provides protection for sensitive skin when out in the sun and playing on grassy areas. It's velcro band helps secure the fit. Posted On 03/03/17 by Sheila Hodge from Knoxville, TN Yes, Sheila Hodge recommends this product! Posted On 03/02/17 by Linda D from Fort Myers, FL Yes, Linda D recommends this product! Posted On 02/28/17 by Dorothy C from Folsom, CA Yes, Dorothy C recommends this product! Great little dress for Hawaii or stateside. Looks so cute on my little 6 PD Morkie. I ordered a small and it fits perfect. Posted On 02/18/17 by Marlene Duplisea from Las Vegas, NV Yes, Marlene Duplisea recommends this product! Bought a medium for my 13 lb shih-tzu and it fits her perfectly. She looks so cute in it. I Love it!